By professional strategies EPOC refer to a range of both individual behaviours (e.g. distributing educational materials) and organisational interventions (e.g. local consensus processes). In this resource we are going to focus on audit and feedback strategies, as an example of a widely adopted strategy that has significant potential but which is not always well implemented. ‘Audit and feedback’ is a label for certain quality improvement strategies directed at ‘professional’ practice. Revisit the EPOC taxonomy if you need to. What do we mean by ‘audit’? Broadly, an audit is a process of checking, to ascertain if activities meet set criteria and comparing ‘what is’ with ‘what ought to be’. What does it involve in practice? In 2004 the WHO recommended introducing a medical audit in all maternity facilities as a way of improving the management of obstetrics emergencies. 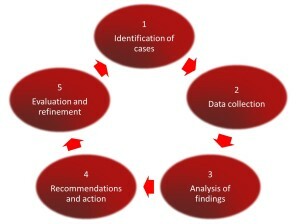 An audit was predominantly viewed as an internal process that involves conducting some or all of the following five steps: case identification, data collection, analysis of findings, action and refinement (WHO 2004). This can involve an expert panel reviewing clinical records and assessing recorded practices against standards or norms by referencing against evidence based guidelines and using clinicians’ collated knowledge and agreement about best practice. In some situations an audit ‘cycle’ is described: Figure 3.4 above shows how this involves the cyclical and reiterative practice of all five audit steps in a perpetual cycle. Other techniques for undertaking audits include: Verbal autopsy within the community, maternal death review within the health facility, individual near miss case review within the health facility, confidential enquiries into maternal deaths at regional and/or national level. 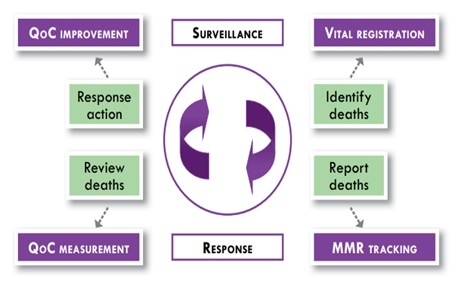 ‘Beyond the Numbers Reviewing maternal deaths and complications to make pregnancy safer’ provides more detail about the types of audit (WHO 2004). See De Brouwere et al for a review of the comparative advantages and disadvantages of these, and the clinical audit, approach (De Brouwere 2013). Provides a vehicle to identify and assess factors contributing to a death. Identifies what change/s are required to reduce avoidable deaths. Provides an opportunity to use feedback mechanisms to promote learning for others, such as health workers not directly involved in a specific case. Provides evidence to advocate for change. Provides the opportunity to package evidence in a manner that will best promote change. Provides an opportunity to sensitise communities and decision makers. Provides the opportunity to categorise causes of death. How is audit used in LMICs for quality improvement of services? Audit has been used for many years in MNH in the form of confidential enquiries into maternal deaths, perinatal mortality reviews and criterion based clinical audit. The most formalised, policy oriented quality improvement activity in LMICs is probably the confidential enquiries into maternal deaths. Here formal reports are endorsed at the highest policy levels. Some countries (e.g. South Africa and Malaysia) routinely publish reports of their confidential enquiries into maternal deaths. Many other countries routinely conduct facility based reviews of maternal and perinatal deaths, but these are not always conducted well and the full cycle of audit is not always conducted. Maternal death audits are more commonly conducted than audits on perinatal and neonatal deaths. A review of perinatal mortality audits in LMICs is available in the list of further reading. How effective have audits been? A 2005 Cochrane review Pattinson RC, Say L, Makin JD, Bastos MH., (2005) highlighted some of the challenges of assessing the effectiveness of audits. Some audit interventions have been evaluated in randomised controlled trials such as the QUARITE (quality of care, risk management and technology in obstetrics) and AUDOBEM (audit of obstetric emergencies) studies in Sub-Saharan Africa. The QUARITE trial was based on a combination of different interventions including audit and reported a reduction in hospital-based maternal mortality in capital and district hospitals where the intervention was implemented, but not in regional hospitals. A small decrease in neonatal mortality was reported but no effects on stillbirth (see Dumont et al 2013). The effectiveness of the AUDOBEM facility based auditswas discussed at the 2013 Global Maternal Health Conference. The discussion and further resources are available for review. There have been fewer studies into the effectiveness of perinatal mortality audits. One meta-analysis of the impact associated with the introduction of perinatal audits in low- and middle-income countries demonstrated a 30% reduction in mortality when solutions identified from the audit process are linked to action (Pattinson et al 2009). Consider your own context: What are the possible reasons why audit is not done well in low and middle income settings? Feedback mechanisms may not have identified and/or included all those who can benefit from the information; for example only those health workers directly involved in an individual case may receive feedback. There is increasing interest globally in using the principles of audit and feedback to improve quality for MNH. Various tools are available to improve the objectivity of audit, or to address the negative and punitive aspects of audit processes. The involvement of communities in conducting audit has also been used. DFID is supporting a large quality improvement programme Evidence for Action (E4A) in six Sub-Saharan African countries which includes the conduct of MDSR in Ethiopia and an MDSR network. Guidelines, case-studies and resources are available on line at: MDSR Action Network and MamaYe! Pattinson RC, Say L, Makin JD, Bastos MH., (2005) Critical incident audit and feedback to improve perinatal and maternal mortality and morbidity.